The first ever BTC season is go, with Strudwick hitting his stride in Race 1. Thomas Strudwick took victory in the first ever race of the British Talent Cup, with the youngster able to take off at the front and escape the pressure of the chasing pack. The youngest rider in the field, Josh Whatley, took second from 13th on the grid, with the podium completed by Fenton Seabright after an incredible charge through following some early drama. Strudwick got the holeshot off the line but polesitter Max Cook soon challenged for it back as the two were joined by Brian Hart in an initial breakaway trio, with conditions cold and damp and seeing a cautious start to the race at Donington Park. By a few laps in, the lead trio had become a quartet of Strudwick, Whatley, Brian Hart and pole position man Cook as the four looked set to fight it out for the podium – but disaster struck soon after for Cook as he was a casualty of the tricky conditions, crashing out of contention. That left Strudwick remaining steadfast in the lead, with Whatley’s charge taking him up into second – and Seabright at the head of the second group and pushing to catch up. Before the lights even went out, there had been trouble for Seabright as he got stranded on the grid and was forced to start from pitlane. But the number 22 got his head down to push for a stunning comeback through the field – up into the top ten by lap five and then able to break away and get into the podium battle. As the laps counted down, Strudwick remained in control in the lead, eventually crossing the line a number of seconds ahead of Whatley to take victory in the first ever British Talent Cup race. Seabright completed his stunner of a race on the rostrum as he was able to catch and pass Hart to take third, with Hart in fourth and able to stay ahead of the big battle for the top five behind. Charlie Atkins eventually emerged from that squabble to take fifth but it was a close-fought war behind him, with Cameron Horsman another to recover from early drama to take an impressive sixth, ahead of Scott Swann and Storm Stacey. 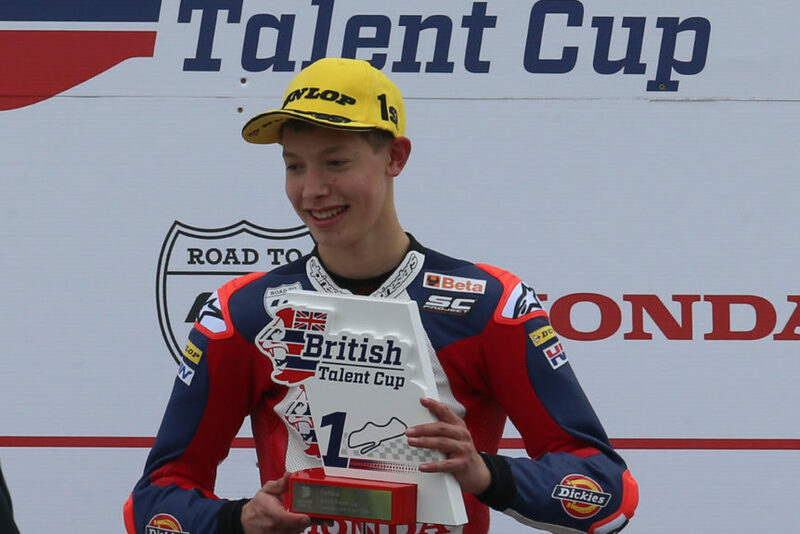 Lewis Paterson took ninth on his British Talent Cup debut, with the top ten completed by Rory Skinner after Skinner sliced through from the back. After the first hand has been played in the unseasonably difficult weather at Donington, there’s not long to wait until Race 2. Can Strudwick kick off his campaign with a double? Or will those on the chase catch the Race 1 winner? Find out on Monday morning at 11:15 (GMT+1)…or BST if you so prefer!